Add some adventure to your life! to bring you the Outdoor Women’s Retreat. adventure tours for women all around the world. Envision a women’s retreat on 4,000 private acres where the grandeur and excitement of the natural world is yours to enjoy. Zion Ponderosa is Utah’s premier destination for outdoor adventure and relaxation. You’ll experience greater happiness, health, and wellness, on this outdoor holiday that will increase your motivation and expand your abilities. View our new Aerial Tour . Morning Hikes: On several mornings our women’s retreat participants will be able to enjoy a guided hike in the beautiful Zion Ponderosa Area. Hike’s range from 3-6 miles in length, beginner to intermediate with options for advanced hikes. All hikes will surround you with breathtaking views and amazing scenery. As desired you may choose to forgo certain hikes, and enjoy other experiences. In cooperation with Adventure Women, Mandy Woodhouse directs the day to day aspects of retreat adventures and experiences. Zion Ponderosa has been a part of Mandy’s life since she can remember. As a young girl Mandy looked forward to summer visits, and while in college she spent two summers working at Zion Ponderosa. She has her undergrad in Health Science and has worked in commercial gyms and private gyms for 10+ years. Mandy has her NASM Personal Training Certification and AFFA Group Instructor Certificate. She has organized weight loss camps, races, and manages, teaches, and trains many individuals in health and wellness. Mandy loves running, hiking, and biking. She loves doing anything active with her husband and three young daughters. The full management and staff at Zion Ponderosa (90-150 seasonal) are at Mandy’s disposal to assist with guided adventures, dining, and all other services. We take great pride in the quality of our dining services and meals provided for our women’s retreats. Using the best ingredients our in-house chef will provide excellent meals. While you’re out being physically active we’re creating great-tasting and nutritious meals that will replenish the needs of your body. Wherever possible we use local fresh vegetables and proteins. Special dietary requirements are happily accommodated, and all foods are prepared with integrity and care. We have a craft beer menu, and fine wine list for all tastes. • Breakfast, Lunch, and Dinner (included). • Specialty lunches for outdoor excursions and adventures. • Additional snacks, drinks, and other food items available. • Beer / wine available for purchase. Our mountain resort sits 6,500′ above sea level and covers 4,000 acres on a large forested plateau that borders the eastern edge of Zion National Park. Visit this link for an aerial view of Zion Ponderosa and Zion National Park. Airline Access to Zion Ponderosa is best accomplished through Denver, or Salt Lake City via connecting flights to St. George, Utah. Daily flights connect from Denver (United Airlines) or Salt Lake City (Delta Airlines). Service is provided by Skywest Airlines, one of America’s finest regional air companies. See links to Delta and United below. Las Vegas: It is also convenient to fly to Las Vegas and catch one of the many shuttles to St. George. (100 minutes), where we will greet our guests and provide transport to the east side of Zion National Park (95 minutes). See list of shuttle companies below. 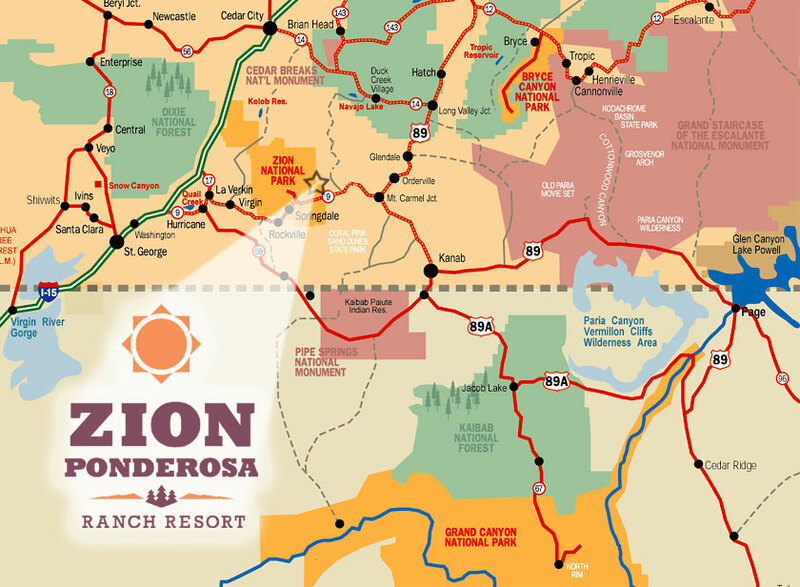 Zion Ponderosa Ranch Resort is situated amidst America’s greatest concentration of natural scenic wonders. Enjoy the comfort of your own private room/suite with locking doors and private bathroom. You’ll share a beautiful lodge-style cabin with other guests, just as you would in a Bed & Breakfast setting, and have access to the kitchen, living room area, deck/porch, and available bonus space. These units are in a gated community approximately 600 yards from the main lodge and recreation area. Benefits include physical , mental , and emotional strength, enhanced by clean air, wide open spaces, scenic beauty, and delicious healthy dining. You’ll venture out across vast plateaus and through hidden canyons in and near Zion National Park, and have the opportunity to forge new friendships, and enhance your quality of life. This remarkable setting for a women’s retreat is Zion Ponderosa Ranch Resort. Your health; physical, mental, and emotional needs are met on our 4,000 acre ranch on the border of Zion National Park.